power supply reads 1.9 milliamps when they are on. Best I can do. Hope it lasts. what is the mAh rating of your battery? usually written on the side. about 300-500 is best you will find but that can be doubled by using two in parallel. that rating is how many miliamps it can charge/drain safely in an hr without getting hot or (dangerous) as if the sealed battery boils and builds pressure it will rupture (pow)..
this can also help in calculating for how long they will stay lit. the battery will continue to light normally until it reaches 50% drained. 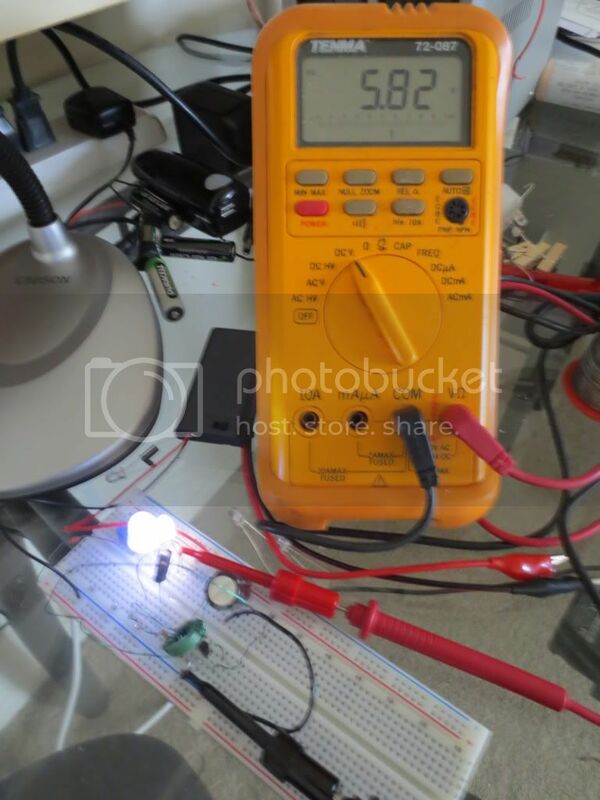 with use of a joule thief that number probably drops to 20 or 30%. with a active current of 1.9 milliamp and 300 mAh you should have a burn time somewhere around 110.52 hrs. from full charge to dead. 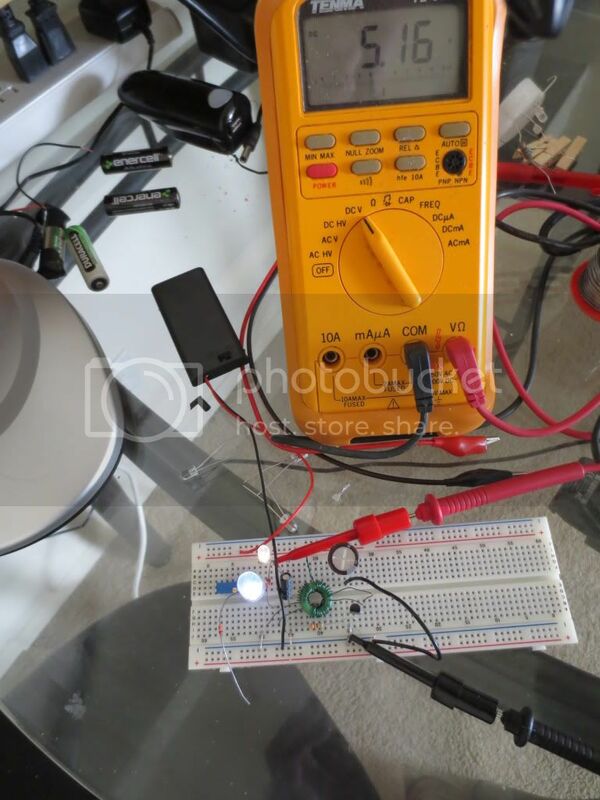 now this is how long the battery can make 1.9ma not how long the diode will stay lit, as voltage falls as it drains and a diode needs so much before it will light or conduct. that data should be listed in the diode datasheet. with this you should have enough data to plan power needs for the project..
ok im am working up a circuit simulation for it now in Ltspice. give me the min cuton voltage & required current of the LEDs and the range of your ldr. I will give you back the "most efficient" values for other R's for the circuit. if you can, find and install the free version of LTspice and I will post the schematic to you so you can play and simulate or even add components to it.. I get 22 ma with two LED's on at 3 volts. They stay bright enough until about 2.5 volts. bright with about 75 ohm resistance. After that it is a matter of judgement on how bright the clock needs to be. ok what is the light dark resistance of the ldr? enough either. My power supply cannot tell me milliamps as well as my meter does either. ok its simulating now will post the schematic and values to you. did you find and install ltspice? its the only way to view the file..
it is super as a way to experiment with EET you just draw your schematic input values for components and hit run. from there you can poke different simulated meters in anywhere you want and even see an o-scope wave form or what ever.. makes it much more fun and reduces cost when you only have to buy what you really need.. I downloaded it, but haven't figured out where the symbols are. I found some sample circuits but no luck running them. Last edited by burger2227 on Thu Apr 04, 2013 8:27 pm, edited 1 time in total. i always said your one smart cookie, getting a replacement like that is the way it should be but you hear happy endings few and far between. and scroll down till you see "cutoff voltage", according to the datasheet this transistor isn't supposed to operate at 3v. the two fully charged batterys will hold around 3.3v in reality but the 2n2222 will cut off when it hits 3v even meaning good battery's wont power the circuit long..
kinda befuddled now as to how it is working but. if it is then more power to ya! he he he..
any way as I figure the large resistor should have been close to 2.7k and the small one roughly 270 leaving the last 30 ohms to be switched by the ldr. that is in an "ideal circuit". and providing 1mA current to 1 diode. but your short by about 30mv to use 2 diodes so I suggest finding higher efficiency transistor or higher voltage. then even if adding a third battery to 4.5v those same resistor values should keep you in a good efficient range. I will need to drop box the schematic for you but will post it in a bit. p.s. in lt spice look for the and gate symbol you should get a popup that says "component" when you mouse over it click it once inside there is a search bar, type "npn" and it will give you a choice of transistors. same for most digital devices batteries n such. the analog devices are on the toolbar where you see the components button. to the left side of the tool bar is a little running man click him to simulate the circuit. you will no doubt get errors till you learn to setup the simulation settings under simulate/"edit simulation cmd" this is simulation timing and step timing toy with it till you get a setting that works because its hard to explain but the help file is good if you take time to read and loads of help on youtube..just search "LTspice" for walk troughs to get you started..
clock looks great by the way very commercial with the light installation..can't tell it wasn't bought that way..
the 75 ohm R is in the collector emitter circuit this is the supply the base emitter circuit is the valve circuit that controls flow. so long as the adequate supply is ready for use the valve controls its flow. you done great in my book Ted, no finer work have I seen from collage graduates. for the most part I don't believe they learn the real meat but just the bare essentials of the text to pass the test. most don't even venture as far as you have now and even professors at my school couldn't tell me the stuff we discussed here already. that is why I ended up teaching while attending. "forest mimms handbooks from the shack"and circuit encyclopedia, worth every cent. when I got to I.T.T. they where astonished and in my view, had no idea but was just teaching to the test. the real meat is in the lab and on the soles of worn-out shoes and burned fingers, youknow.. I created the ASC file and it loaded, but said something about an error. Like I said, reality beats theory every time! a lighter or match to make clean solder connections. Each loop through the ferrite core center counts as a turn. 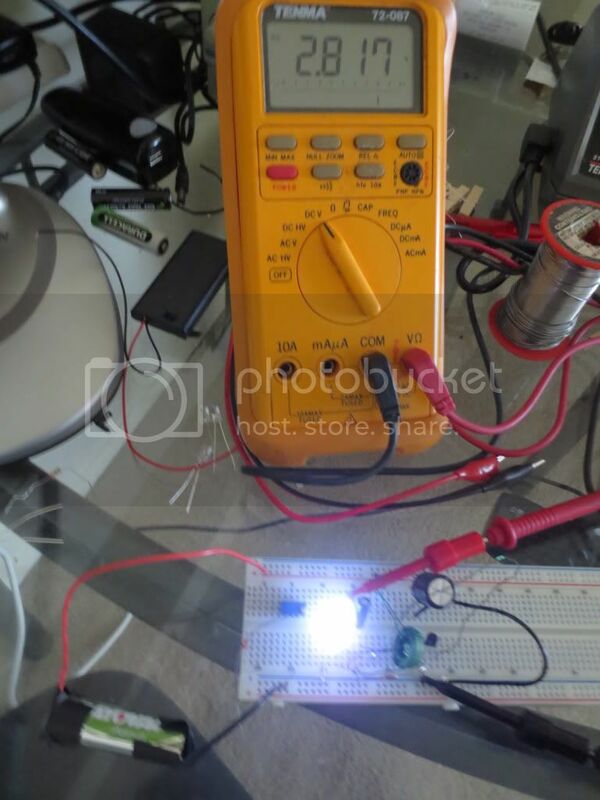 The voltage coming from the coil flyback is almost 5.2 volts with 10 turns on all 3 windings. Voltage is measured from the cathode end of the diode to the LED. A Shottkey diode adds another .05 volts. Two batteries are driving a 5mm and 10mm bright LED wired in series. on a 4.7K resistor to the base. It doesn't heat up at all now and the LED is just as bright! The number of turns on the flyback can be changed to suit LED voltage needs to a degree. 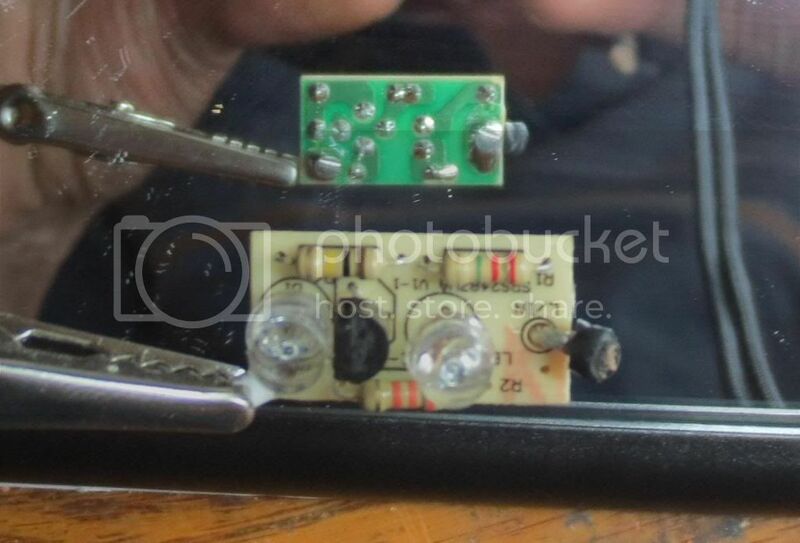 You can also add a light dependent resistor from the transistor base to ground now to turn it on at night. 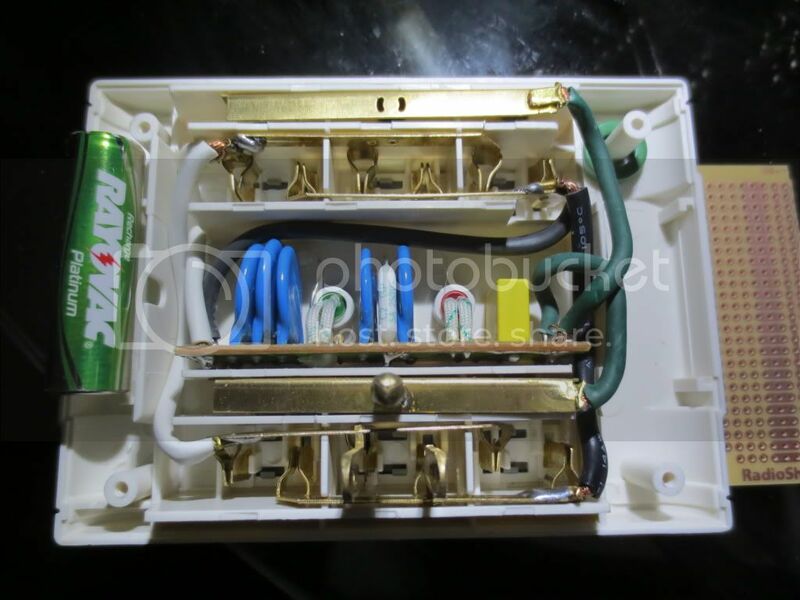 to set up the existing wiring for the power monitor high voltage circuit. The old circuit with the ugly orange LED is at top. It looked like an old neon bulb. Last edited by burger2227 on Tue May 07, 2013 12:49 am, edited 3 times in total. without the back of the box securely screwed back onto the box! the coil up on its side and put it in the area on the left. Electrolytic caps could go on the right. The copper clad circuit board came from Radio Shack. I had to cut the board in half to accommodate circuit requirements. 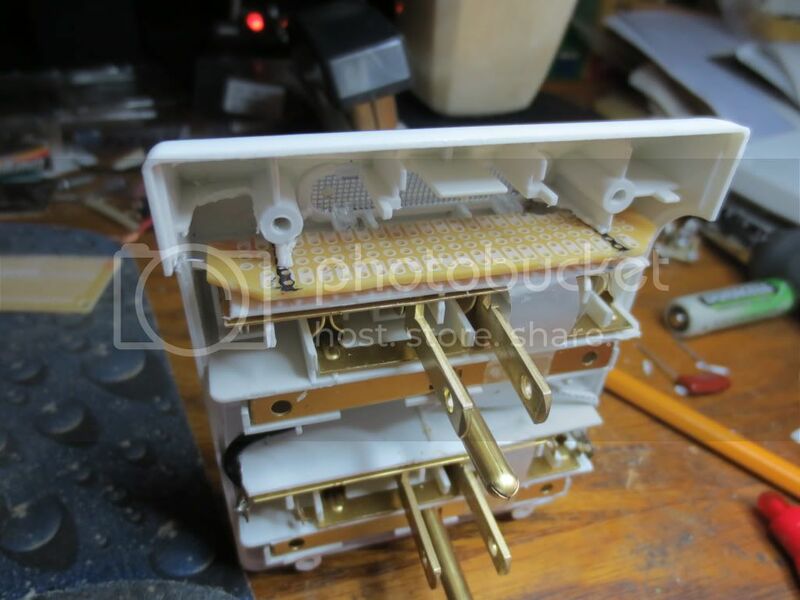 MOV, resistors and diode to the battery will go to the left of the battery. in the center. The space in the middle fills up faster than you think! something and will have to spend hours figuring what I did wrong or find a bad connection. Here is what the final product will look like when the power goes out. It gives off plenty of light! 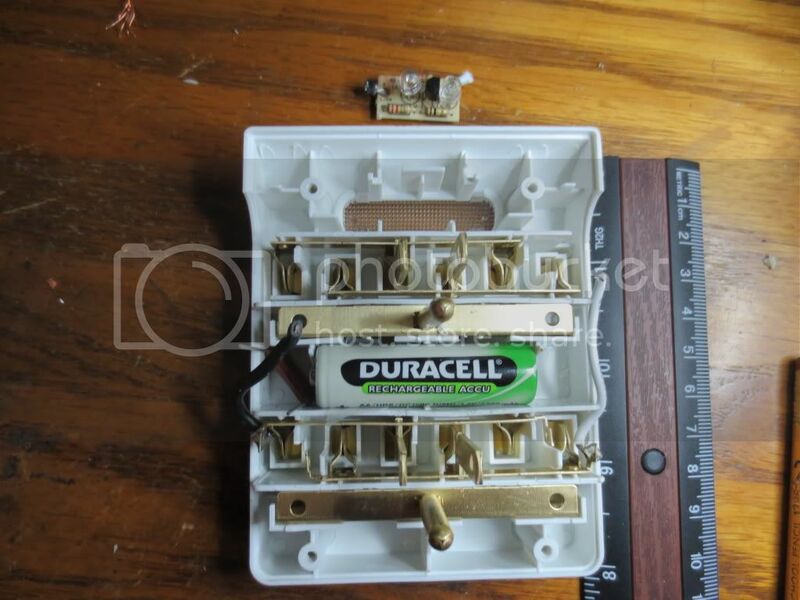 of this project, was nice enough to send me some 25 volt varistors to protect the battery circuit components. He resides in Thailand... He has also provided knowledge and assistance in making this project work as designed. transistor which is already mounted on the board. I will update this as I go. but since the AC is not rectified, the LED will light when there is AC voltage using the reverse duty cycle. PNP transistor's base no longer has voltage on it. Note: The AC trickle charging .068uf 300 volt(or higher) Mylar capacitor value may be designated as 683K on the case. The prototype LED circuit has been running with a photocell added to the base of the 2N4401 transistor for 3 nights so far. 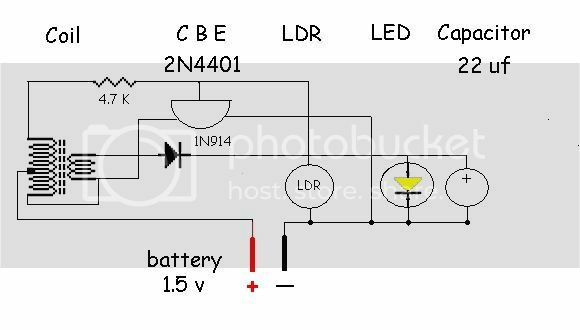 The LED circuit will run on the battery constantly without the high voltage trickle supply to the PNP transistor base. Last edited by burger2227 on Sun Apr 14, 2013 3:26 am, edited 1 time in total. I added the green LED and a green wire to go to the AC trickle charging circuit next to the battery. Note: The 2N4401 base resistor R7 should be about 4.7K to keep the transistor running cool! not on the circuit board. 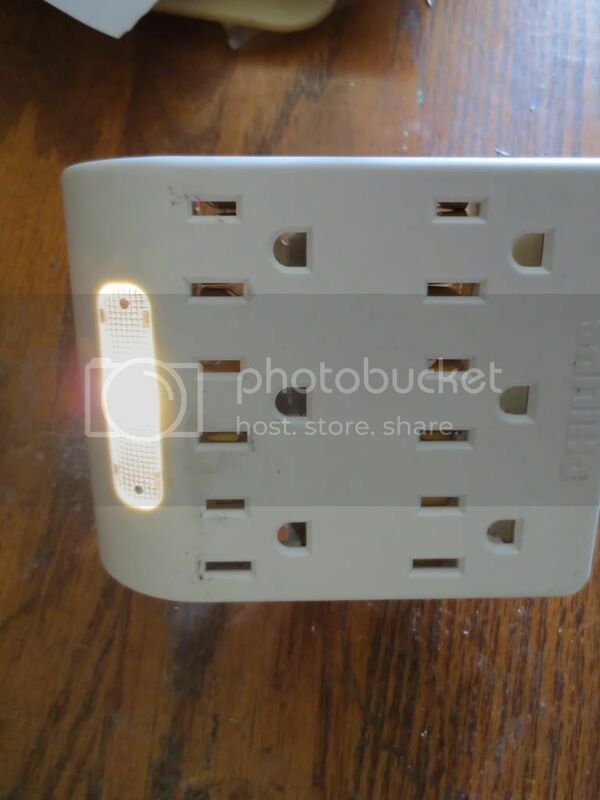 I did this to isolate the AC voltage from the low voltage circuit as much as possible. Use 1N4004 or higher rated diodes to rectify the trickle voltage for safety sake. 1N4007 is rated for 1000 volts, 1 Amp. 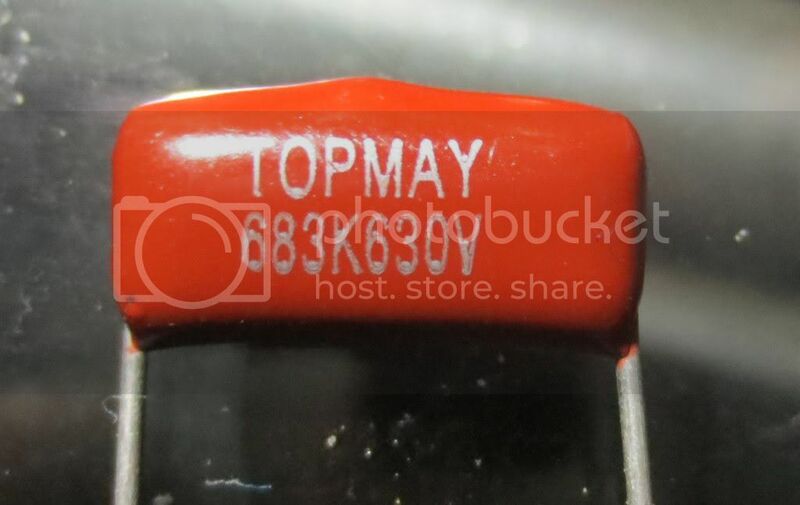 Note that the required jumpers are numbered 1 and 2 for the two 100 uf electrolytic capacitors only. with the 1K resistor that pulls the base low on the PNP switch transistor to activate the light. contact with other components or wires should be avoided! The tab usually denotes the emitter side. recommended, but I ended up having to scrape it too to hold the solder connections better. very brightly. The rechargeable battery lasted 2 days with one LED and one day with two of them in tests. during the day. It is so sensitive that it lights up if I walk past it during the day. A proximity sensor perhaps? 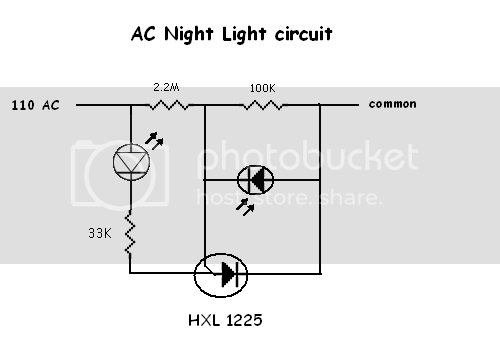 Flyback circuit with photocell (LDR) will come on when in a shadow. are four times as bright and rated at 6000 mcd. That may do the trick! Last edited by burger2227 on Thu Apr 04, 2013 10:56 pm, edited 1 time in total. rated to handle surge currents at 40,000 amps. 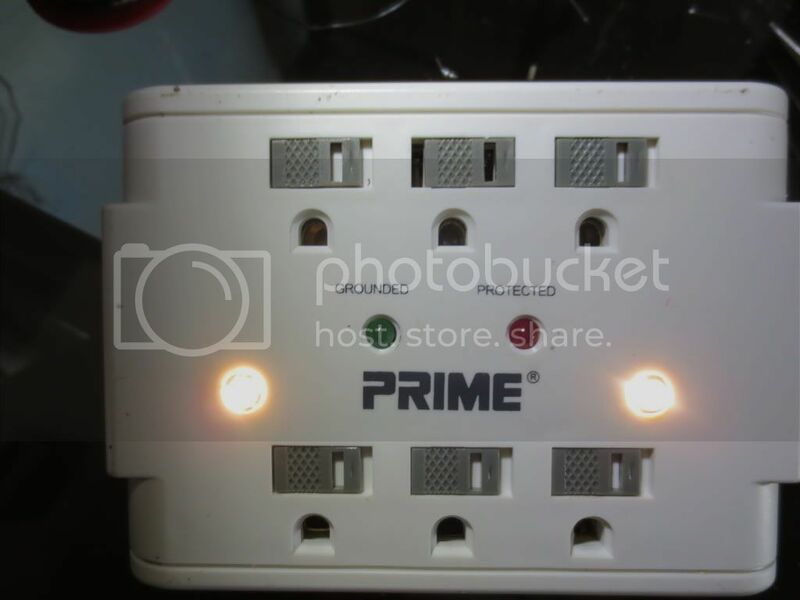 Here is the power adapter in use. 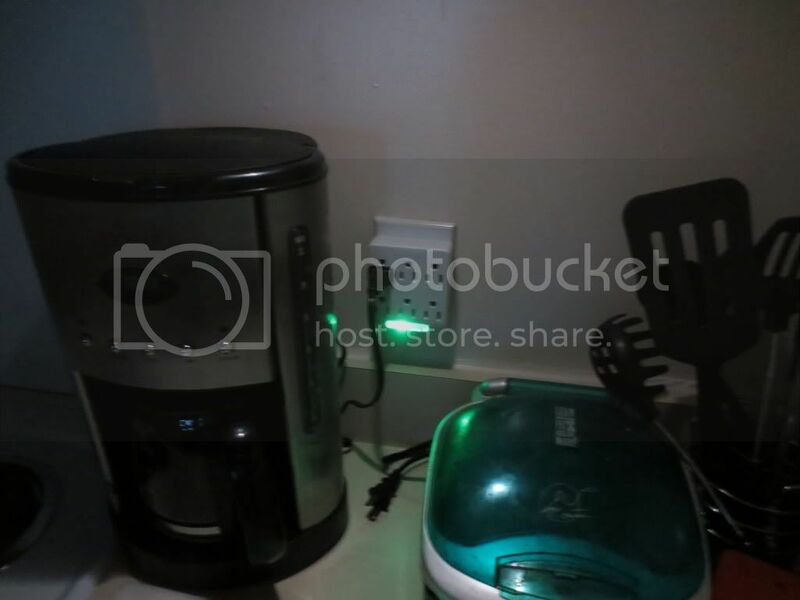 The bright green LED helps at night. and should last a long time as it is trickle charged. Don't use normal batteries with the trickle charger! either use two in opposing directions or use a diode in the opposite direction to accept the reverse voltage cycles. In the power failure circuit, the opposing AC rectifiers are the diodes to the battery and PNP switch transistor. Otherwise an opposing LED will burn out from too much reverse current! Last edited by burger2227 on Sat Apr 27, 2013 6:33 pm, edited 1 time in total. the SCR anode. 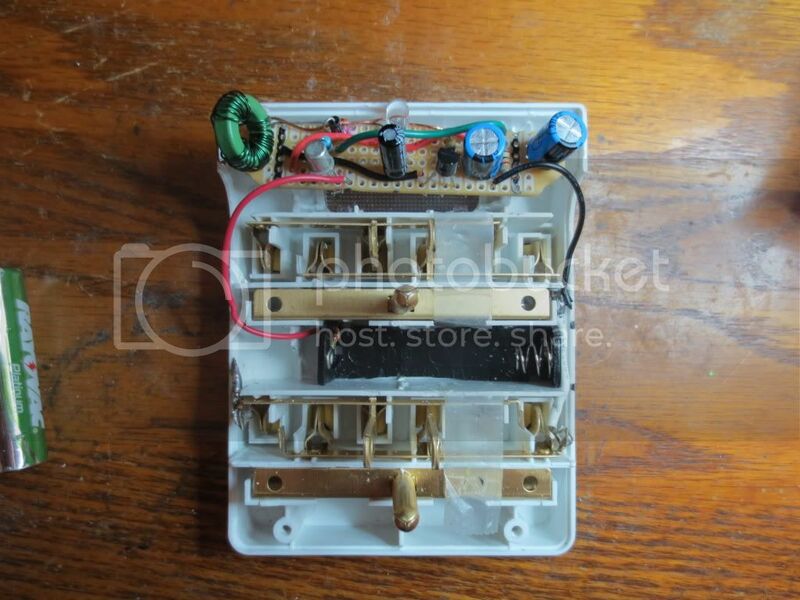 The light sensing diode controls the SCR gate by pulling it low when it senses more light. or using power = (I ^ 2) R = (.0036 ^ 2) * 33,000 = .4276 watts. Safely under 1/2 watt! Substituting a higher current LED will require increasing the wattage and lowering the resistance. Low-current: typically rated for 2 mA at around 2 V (approximately 4 mW consumption). 2.9 to 4.2 V for violet, pink, purple and white. Ultra-high-output: 20 mA at approximately 2 V or 4?5 V, designed for viewing in direct sunlight. 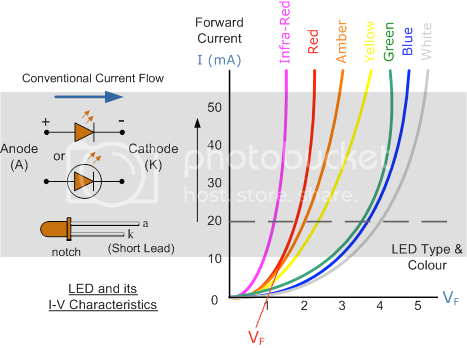 The chart indicates that current draw goes up very quickly at certain forward voltages(Vf) for different colors. 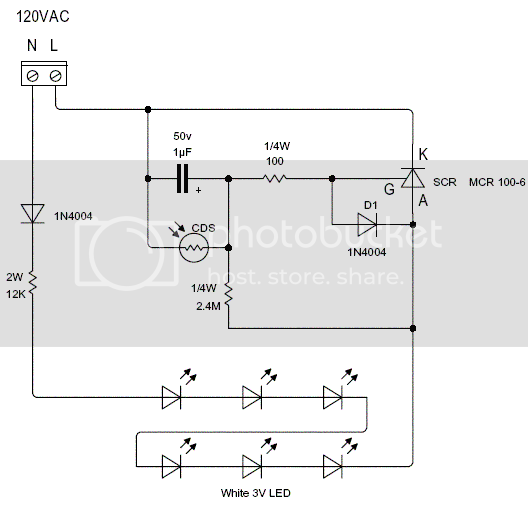 The required 12K, 2 watt resistor limits the 6 LED current draw to 10 milliamps. The SCR also rectifies the AC current. 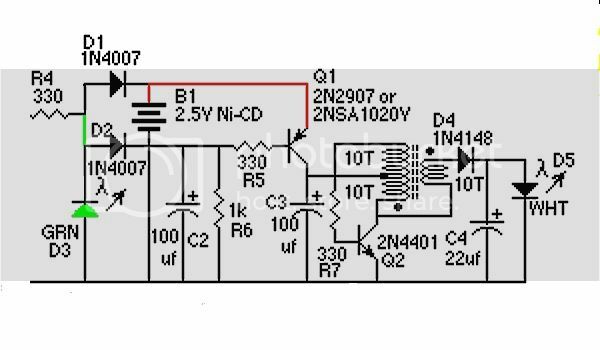 The CDS or LDR pulls the SCR gate voltage low during the day to cut off current through the circuit. Interestingly the LED calculator says that it would be 2 watts no matter how many LED's are connected in series. 1 or 16, but the brightness would be affected I would imagine. 6 in parallel would require 12 watts! 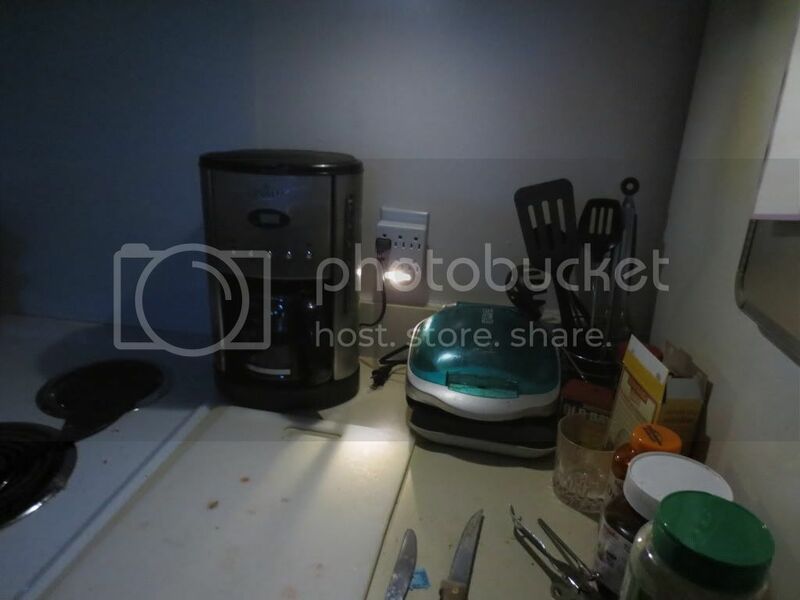 Last edited by burger2227 on Thu Apr 18, 2013 2:42 am, edited 8 times in total. 1/2 watt resistor on each giving them about 3 milliamps of current using 2 volts each. coil if necessary as shown. There is plenty of room for the power failure circuit board on the right side. A bright 10mm LED could be placed on each side in parallel perhaps. the MOV ratings, but none are marked. The fuses are rated 5 Amp and set for 115 degrees. Leave the heat wrapping on them or it may not work correctly! There is also a generic version available at Lowes for a few dollars more than Kmart's. No brand name on the unit. Last edited by burger2227 on Fri Apr 26, 2013 8:01 pm, edited 1 time in total. 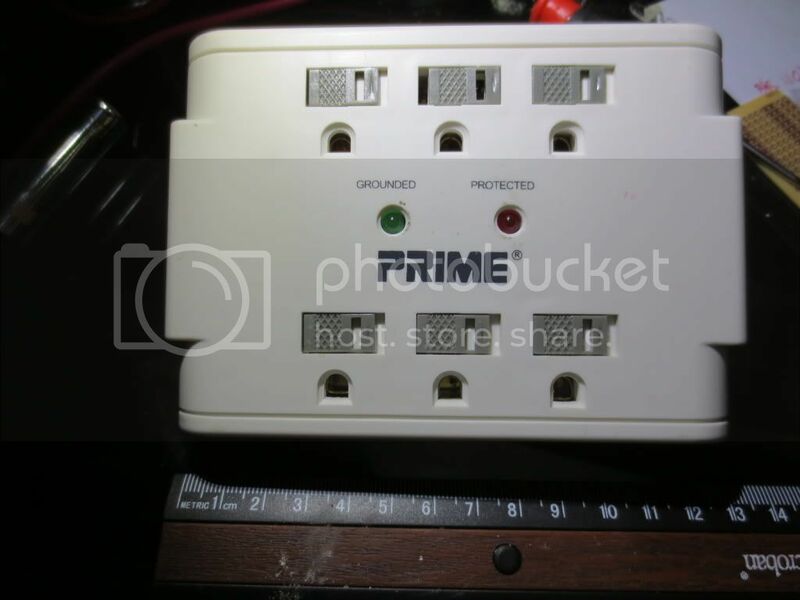 Here is the surge protector with the PC board on the right and rechargeable battery on the left. circuitry. 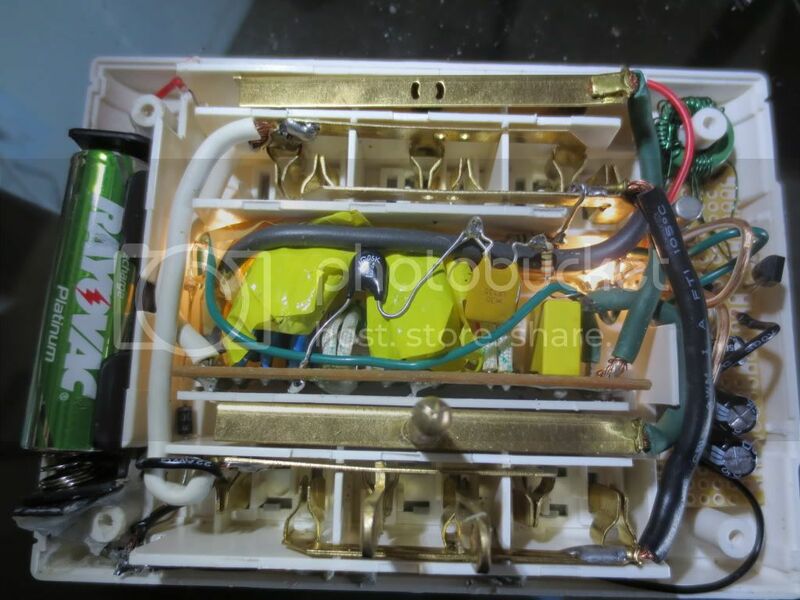 The smaller green wire carries the trickle charge current to the battery and switch transistor. Since I did not need the green LED to indicate power, I just used 2 diodes on the left side of the surge box. A 1N4007 diode goes from common to the green wire. 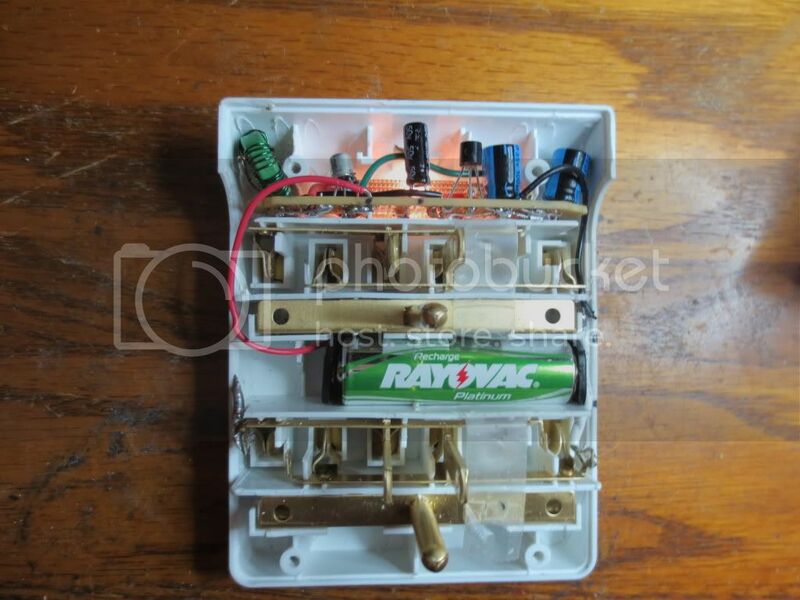 A shottkey goes from the green wire to the battery. buses. Yes you can run two bright white LED's with the power failure circuit and they work pretty well. Here's what it looks like when there is no AC power. With power only the red protected and green ground LED's are lit. The white LED's are mounted in clear diffusion lenses. This box worked out real nice and it has a lot of room for the circuitry! The polymer re-settable fuses require the voltage to be removed to reset. They are available online with different amps. The 30 is volts and 1.35 is the current rating of 1.35 amps. I did not find lower current ratings yet. until I took it back apart and realigned them. It could have been far worse! BOOM! 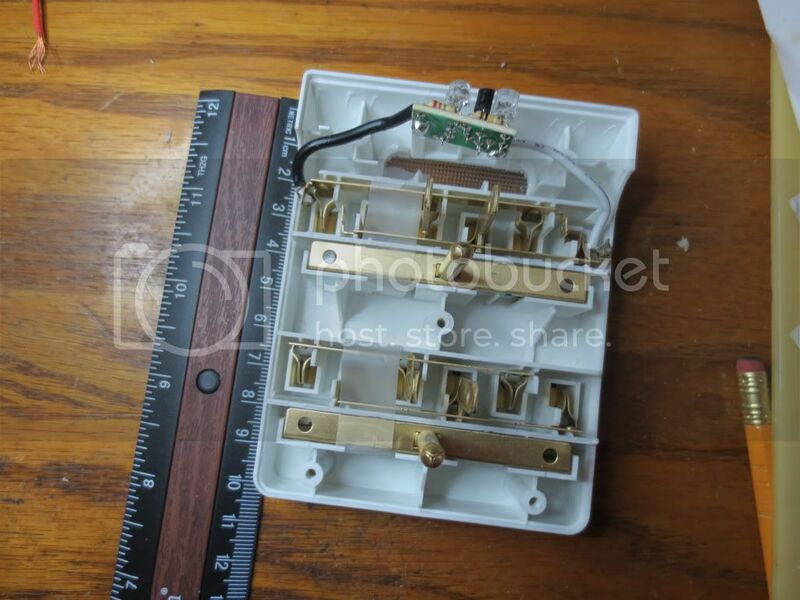 One benefit of using outlet boxes is that you have to put the back on to test the high voltage out. Don't try to insert the boxes with the backs off of them! The buses can pull out and shock or explode!